First batch of iPhone 5s sold out quickly from the online Apple Store after it opened for iPhone 5s order today at 3AM Eastern time, midnight Pacific. Let’s get the facts straight. 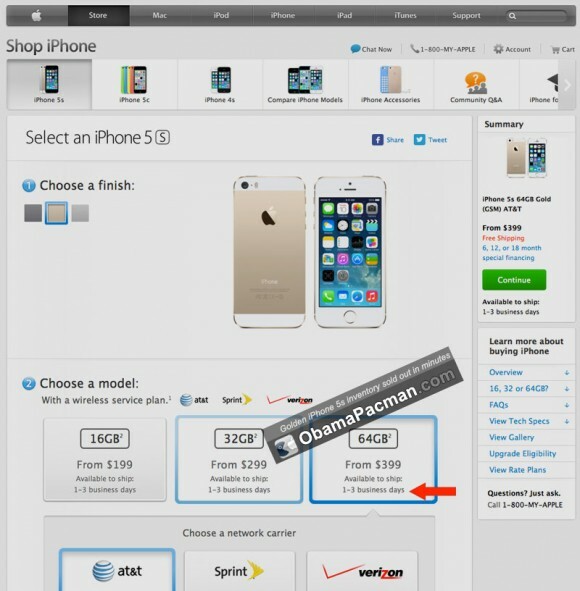 Yes, there was 64GB gold iPhone 5s available for 1-3 business day shipping when the online Apple Store opened. But those first batch of gold iPhone 5s quickly sold out. Within five minutes, the shipping status of AT&T + Verizon carrier-bound and unlocked T-Mobile 16GB, 32GB, and 64GB iPhone 5s changed. Those who are too slow see “7-10 business day shipping”. Within the hour, all first day inventory of iPhone 5s of all colors sold out. Shipping from October. I almost ordered online but I am traveling right now (to Washington D.C. region again). Therefore I can’t get it shipped to my new address. Thus, I’m in a very well maintained line at Apple Store Tyson’s Corner. Bad news: Apple employee just announced there are only 11 golden iPhone 5s at this flagship Apple Store. This entry was posted on Friday, September 20th, 2013 at 6:37 am	and is filed under iPhone. You can follow any responses to this entry through the RSS 2.0 feed.